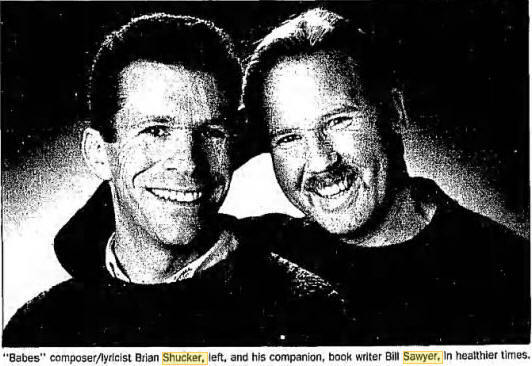 Brian John Shucker (May 29, 1958 - April 12, 1991) with his partner William "Bill" Sawyer (March 28, 1953 - August 12, 1991) were the authors of the musical Babes, a 1940s-style musical that opened in Los Angeles just before their deaths due to AIDS complications. Sawyer was from Camas, Washington. In 1980 Shucker worked at Curtain Call Theater in Tustin, California where he met Sawyer, who became his collaborator and companion. Sawyer wrote the book for Babes. In winter 1990 the first run of Babes opened at the Cast Theater, and it ran for 15 weeks. Sawyer who was completing their second full musical together and at Shucker's death said "I have several more years left", died on August 12, 1991, exactly four months after Shucker. Shucker and Sawyer are listed side by side on the AIDS quilt project. ""Babes"". The Los Angeles Times. 1991. Retrieved 6 October 2017. "Brian Shucker, 33; Composer-Lyricist of 'Babes'". Los Angeles Times. 1991. Retrieved 6 October 2017. "Courage Behind "Babes" - 13 Apr 1991, Sat • Page 356". The Los Angeles Times: 356. 1991. Retrieved 6 October 2017. "Brian Shucker, 33, the lyricist and composer who created..." The Baltimore Sun. 1991. Retrieved 6 October 2017. "AWARD-WINNING COMPOSER BRIAN SHUCKER DIES OF AIDS AT 33". Deseret News. 1991. Retrieved 6 October 2017. "Block Number 03942". Retrieved 6 October 2017. Rice, Darcy; Michetti, Michael (1996). Yearbook: The High School Musical. Dramatic Publishing. Retrieved 6 October 2017.